WILLIAMSTOWN, Ky. — Thousands flocked to the grand opening of Answers in Genesis’ Ark Encounter on Thursday, a project of biblical proportions that has been two years in the making. As previously reported, the Ark Encounter is a theme park in Williamstown that features a full-scale replica of the ark that God instructed Noah to build to escape the coming flood, as outlined in the book of Genesis. 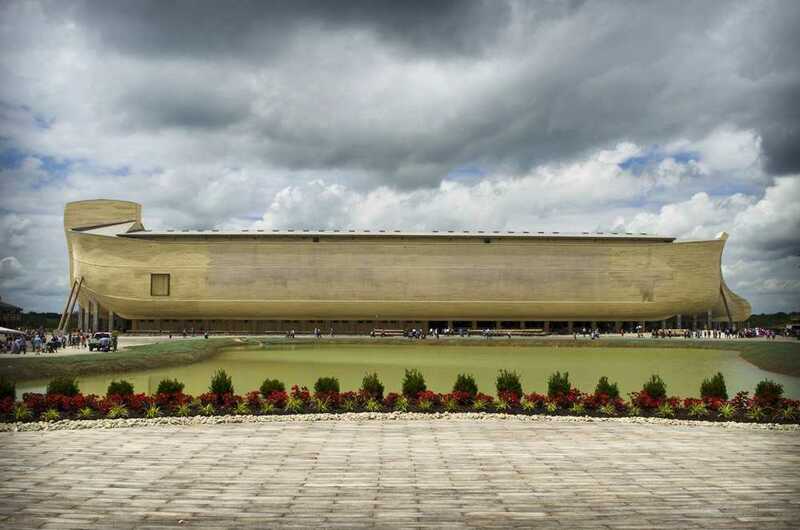 “As the largest timber-frame structure in the US, the 510-foot-long full-size Ark is designed to be family-oriented, historically authentic, and environmentally friendly,” the website for the theme park outlines. Scripture states that at the time of the flood, “God saw that the wickedness of man was great in the earth, and that every imagination of the thoughts of his heart was only evil continually.” Noah, a “preacher of righteousness,” warned the world to turn from their sins lest they face judgment, but all refused. Answers in Genesis President Ken Ham says that he desires for the attraction to provide visitors with the same message for today’s world. Inside of the ark are life-size mannequins and sculpted creatures that tell the biblical story, as well as a 2,100 seat restaurant and gift shop. The site also includes an animal exhibit called the Ararat Ridge Zoo, complete with alpacas, donkeys, emus, goats, sheep, yaks and more. On Tuesday, an estimated 8,000 people gathered outside of the Ark Encounter for an invite-only ribbon cutting ceremony for donors, and on Thursday, several thousand more arrived for the grand opening. Representatives of groups such as American Atheists, Secular Coalition of America, Freedom from Religion Foundation, United Coalition of Reason and others protested outside of the Ark Encounter as they took issue with the site’s message about Creation. But others gathered to protest the protesters and take a stand for biblical truth. Ham says that he is pleased with the turnout and the support. Ham also plans to build a replica of the Tower of Babel in the next few years to speak against prejudice and racism, as well as an ancient walled city like those mentioned in the Bible.